Context Free is a program that generates images from written instructions called a grammar. The program follows the instructions in a few seconds to create images that can contain millions of shapes. To readers of Make magazine: We are delighted that Issue 17 has a four page article about Context Free by John Edgar Park. After you've downloaded the program, and worked through the article's example, create some designs of your own and upload the best to our gallery. For more information, check out our friendly forums. The gallery contains almost a thousand works of art created by artists from around the globe. Context Free is, well, free! You can download the software and start creating art on your computer right now. 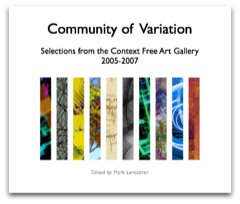 Now available: A 150 page printed book featuring some of the best work from the Context Free Art gallery.